Feeling a bit sore about the abandoned Star Wars Battlefront III, previously in development at TimeSplitters and Haze house Free Radical? Here's a little salt for that wound, alleged Star Wars Battlefront IV concept art. 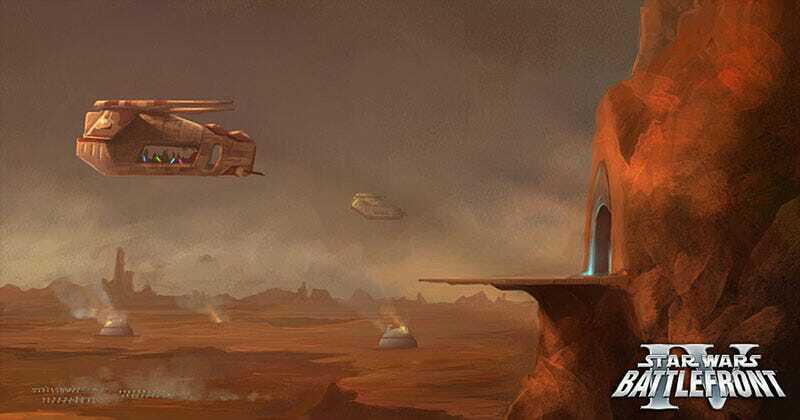 Unseen64 has more than a dozen purported concept paintings from the fourth Star Wars Battlefront game, which seems to have a focus on the planets Utapau from Star Wars Episode III - Revenge of the Sith and Dagobah from The Empire Strikes back. The site credits not-for-profit internet hound superogatory with the find, which curiously doesn't appear on his own blog. That's Dagobah right there, which the unnamed developer on the rumored game appears to have fleshed out with authentic looking architecture and vehicles, namely the Dagobah tank. Whether we'll actually see the promise of Star Wars Battlefront III or Star Wars Battlefront IV is up to LucasArts. But for now, an ogling of this purported concept artwork will give your eyeballs a good enough "What if?"